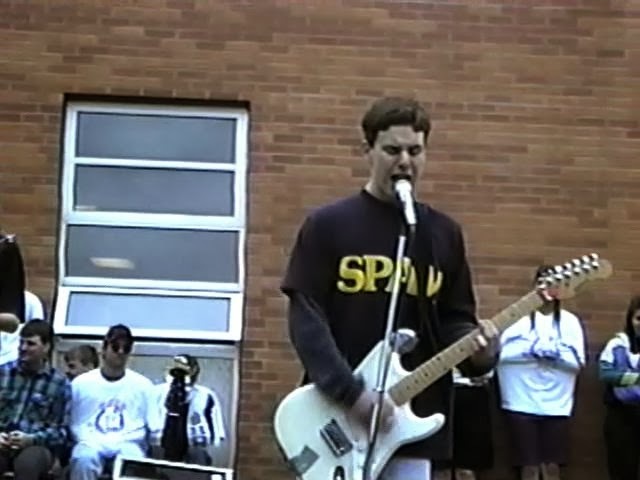 This is John Wheatley in highschool, shredding through Nirvana songs in the grassy courtyard after class. Teachers haul off the skinny kid on bass when he gets too rowdy. John screams on, some boys in t-shirts mosh, some girls are caught on camera miming "we're not worthy", Wayne's World style. Chicagoans may know him better as John Bellows, sometimes a heart-wringing acoustic act, sometimes an ear-splitting satanspawn on bass screaming, HEY! I WANT TO MAKE YOU DIE. His songs are incredible. He is amazing. And now he's going away. John brought me a documentary he recorded years ago on VHS as well as some of the oddest footage he had saved up over the years. We concocted a VHS program of his short films and old performances, full of fabulously stupid surprises and beautifully awful tracking and magnetic stripping. He called it, JOHN BELLOWS IS JOHN WHEATLEY. We will screen a good portion of JOHN BELLOWS IS JOHN WHEATLEY at John's farewell party/ Dikarya tape release, at The Peanut Gallery on Nov. 25th!